Starting life as a magazine back in 1992, we switched to the web in 2015. Now the UK’s pre-eminent comics and genre website, Tripwire will be putting together the TV and film section in Comic Scene UK every month. “We are very excited to be collaborating regularly with Comic Scene, as they have been doing some great work since they launched this spring. We have been contributing articles to the magazine so far but with it made sense to further cement our relationship in this way. The first section will include a roundup of New York Comic Con, a look at the 15th anniversary of The Walking Dead and more,” Tripwire’s editor-in-chief Joel Meadows revealed. 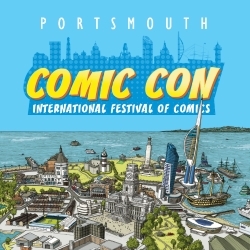 Tripwire is also the producer of the Portsmouth Comic Con each May.